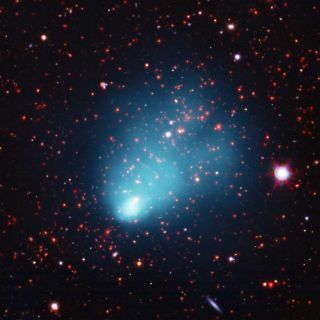 A composite image shows El Gordo in X-ray light from NASA's Chandra X-ray Observatory in blue, along with optical data from the European Southern Observatory's Very Large Telescope (VLT) in red, green, and blue, and infrared emission from the NASA's Spitzer Space Telescope in red and orange. Image released Jan. 10, 2012. AUSTIN, Texas — The largest cluster of galaxies seen yet in the early universe, a giant that astronomers have dubbed "El Gordo," could one day reveal secrets about the invisible dark matter that fills the universe, researchers said. El Gordo — which means "the fat one" in Spanish — is officially known as ACT-CL J0102-4915 and "is located more than 7 billion light-years from Earth, at a time when the universe was half its current age," study co-author John Patrick Hughes at Rutgers University told SPACE.com. The universe is about 13.7 billion years old. The monster galaxy cluster has mass about 2 quadrillion (that's 2 followed by 15 zeroes) times that of the sun, making it "the most massive known cluster in the distant universe." Dark energy seems to make up 73 percent of all the mass and energy in the universe, and is driving the accelerating expansion of the universe. Unseen and as-yet-unidentified dark matter makes up about 23 percent of all the matter and energy in the universe — scientists know it exists because of the gravitational effects it has on galaxies. The regular matter that makes up humans, planets and stars constitutes only 4 percent of the universe. El Gordo was discovered using NASA's Chandra X-ray Observatory in space and the Atacama Cosmology Telescope in Chile. Its Spanish nickname is a nod to the Chilean connection. The scientists detailed their findings today (Jan. 10) at the annual meeting of the American Astronomical Society here during a presentation that included a separate announcement of the discovery of the most distant galaxy cluster ever seen in the early universe. Gas in El Gordo can reach super-high temperatures of nearly 360 million degrees Fahrenheit (200 million degrees Celsius), based on X-rays collected by Chandra and the European Southern Observatory's Very Large Telescope in Chile. "This cluster is the most massive, the hottest, and gives off the most X-rays of any known cluster at this distance or beyond," said study lead author Felipe Menanteau of Rutgers University. This heat, as well as the fact that galaxies within the cluster are concentrated in two distinct groups, suggests El Gordo is the site of a violent merger between two galaxy clusters. "Galaxies are moving within the cluster at speeds of typically 3 million miles per hour," Hughes said. Although a cluster of El Gordo's size and distance is extremely rare, it does fit within the standard Big Bang model of cosmology. This suggests the universe is composed predominantly of dark matter and dark energy, and began with a Big Bang about 13.7 billion years ago. "Gigantic galaxy clusters like this are just what we were aiming to find," Hughes said. "We want to see if we understand how these extreme objects form using the best models of cosmology that are currently available." Future research can seek to model how dark matter separates from the gas in El Gordo, Hughes said. This could yield key details about dark matter's nature. A paper describing these results has been accepted for publication in the Astrophysical Journal.